It has been said that every poem should be revised 50 times. Often, when reading submissions, it is felt that the poet would have benefited from attending a workshop. For current meeting dates and location, see www.towerpoetry.ca. Bring 20 copies of your poem to be workshopped, or just come and sit in until you feel comfortable with the process. No workshops are held in December or the summer months. 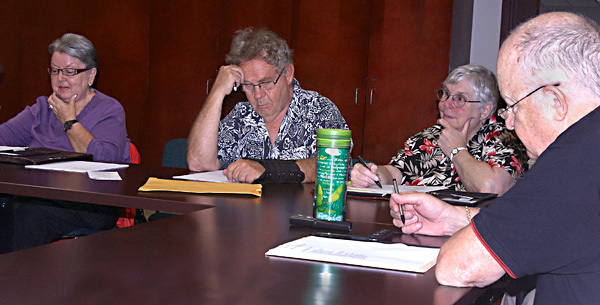 One monthly meeting each year is devoted to learning about a specific kind of poetry, or about the life and work of a single poet. The February 2014 PoetryTALK was presented by Eleanore Kosydar on the theme of LANDSCAPE, POETRY, PHOTOGRAPHY: A Creative Synergy. A Power Point selection of photographs accompanied the talk. The 50th Anniversary PoetryTALK was presented in the form of a public lecture delivered to a large audience by poet John B. Lee. In his address, the well-known Brantford poet drew extensively upon his own work in his thoughtful, and thought-provoking, reflections on the theme of ROOTS.